The unique stone house at the corner of Pennsylvania Avenue and Valentine Road is now called The Writer’s Place. Built as a home in the early 1900s, the house became a church in 1954. 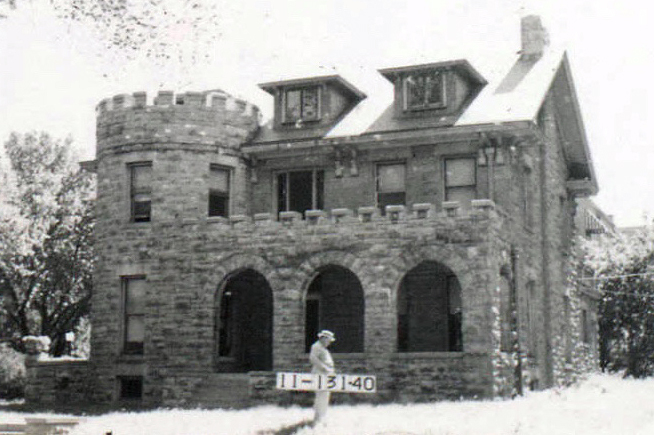 Much of the property on the east side of Pennsylvania was once owned by Nellie G. Nelson, the daughter of Kansas City pioneer A.B. H. McGee. Elaborate stonework on all or part of the homes is typical of this block. Early maps of this Valentine neighborhood street show most of it once was owned by Nellie G. Nelson, the daughter of Kansas City pioneer A.B.H. McGee. Nellie married William W. Nelson, himself the son of a pioneer family, in what was one of the most celebrated weddings in Kansas City history in 1890. Nellie later lived at 3765 (later 3711) Pennsylvania. An early plat map of the Roanoke subdivision shows some of the original owners of the Pennsylvania Avenue property. A.B.H. McGee. Jr. and Nellie G. Nelson (daughter of A.B.H. McGee) owned several large tracts. This week, the focus is on the east side of Pennsylvania from Valentine Road to 38th Street in the Valentine neighborhood. 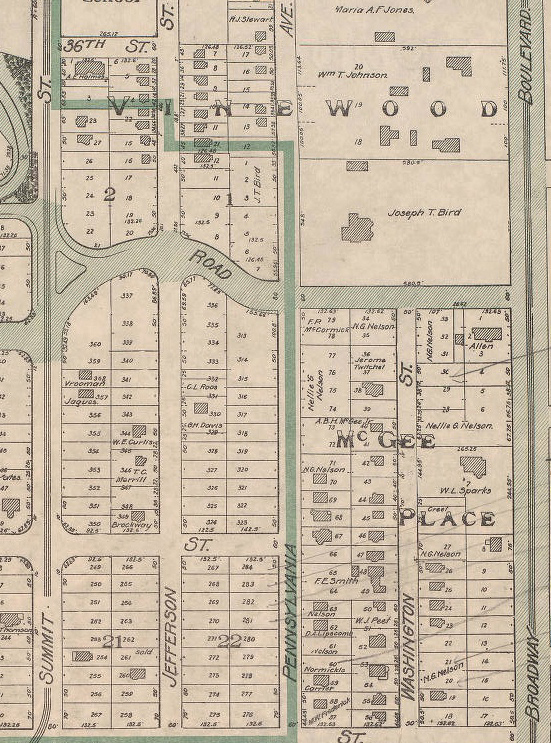 The early history of the Valentine neighborhood is dominated by the name of A.B. H McGee. James H. McGee was one of the earliest settlers and once owned 1000 acres of what became downtown Kansas City. In 1890 McGee’s daughter Nellie married William W. Nelson, the son of another pioneer family. The wedding was major news in Kansas City papers. 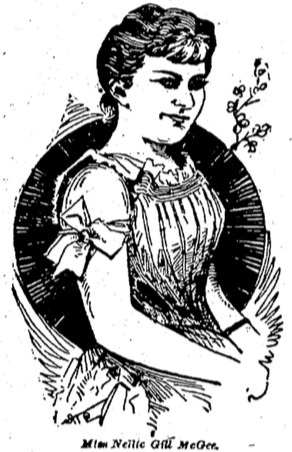 One article in the Oct. 30, 1890 Kansas City Times was called Amidst a Bower of Roses, and devoted an entire page to a description of the importance of the wedding, the decoration of the A.B.H. McGee home, and the important people who attended. “It has interest of romance to a younger generation and an interest in reunion among those who have figured in the struggles and progress of this now city,” the Times concluded. Nellie G. Nelson was living at 3711 (earlier 3767) Pennsylvania in 1914 when she divorced Nelson. Adelbert P. Nichols, president of A.P. 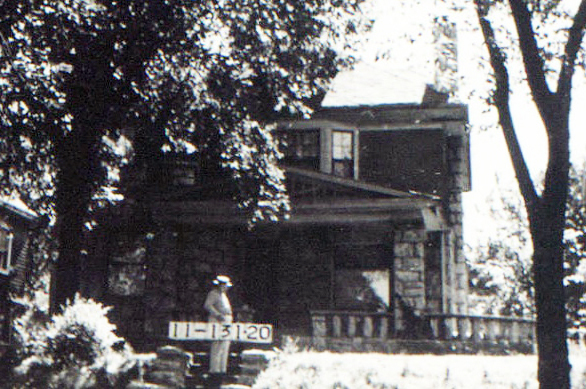 Nichols Investment Company, lived in this home at the corner of Pennsylvania and 38th Street in 1920. His wife Laura taught school before they got married and his son A.P. Nichols Jr. built Westport Shopping Center. 3787 Pennsylvania: Adelbert P. Nichols, a real estate agent and his wife Laura, daughter , two sons, and mother, as well as an Irish servant named Mary Ryan. 3783 Pennsylvania: Fred Carrier, a wholesale lumber merchant and wife Elizabeth. 3719 Pennsylvania: George H. Hope, a medical inker, wife Ida and an Irish servant. 3767 Pennsylvania: William Brace, an automobile wholesaler, and his wife, daughter, father-in-law and three roomers. 3655 Pennsylvania: Edward E. Holmes, a financial agent for a trust company, and his wife, son, father-in-law and a servant from Missouri. 3649 Pennsylvania: Searcy Ridge, a life insurance agent and his wife Elizabeth. 3632 Pennsylvania: Joel Witmer, a manager, and his wife and two children. 3625 Pennsylvania: Frank Lott, a real estate agent, his wife, son, daughter, and a servant. 3617 Pennsylvania: Thomas J. Radford, a retail druggist, and his wife and and one servant. Most of the homes on the block were built around 1910 and are still standing. The slideshow below shows the homes as they looked when this set of photos was taken in 1940.